Last night, my remarkable rescue dog Sarah was Delta Society certified. To show you just how far she's come, here's her story. . .
Three years ago, Sarah came to me as a foster dog, emaciated, afraid of people, and, I believe, dying. After eating a high-calorie diet for three months as she recuperated in my home, she managed to put on 11 of the 25 pounds she needed to gain, only to lose all of the weight and more when she developed a minor skin infection. Her body was simply too weak to fight it. Luckily, I was able to find a holistic vet, Dr. Fred Pomeroy, who treated her with herbs and supplements and saved her life. Psychologically, her recovery was much slower. Uncomfortable being in the same room with me if I was holding food, she'd panic and bolt. Part of her tongue was missing from an injury I could only guess at, and it was clear she had suffered profound traumas in the breeding facility that had been her home before coming to Second Chance Animal Rescue. I've been told she lived in a horse stall, and evidence suggests the conditions were deplorable. Her coat was dull, but her eyes flashed fear at the slightest unexpected movement. She was emaciated and terrified. I don't know anything else. She was vetted and spayed immediately, after which I picked her up and brought her to my house and discovered a huge hematoma, which threatened to need another surgery to drain. In an effort to avoid that, I'd curl up with her, pulling her bony body to me every few hours and placing hotpacks on her abdomen to bring the swelling down. Eventually she learned to enjoy our ritual. She'd relax ever so slightly and hold her leg so I could hold the warm towel against her sunken belly. Little-by-little I fell in love with her. Maybe it happened when I placed those towels on her, or maybe it occurred as I celebrated each ounce she gained. Maybe it happened when she tried to die as I willed her to live--until a very wise friend, Deb Schneider, told me it was time that Sarah start to fight for herself. I know that I loved her when I accepted that she might not make it. Three months into our journey, she took a turn for the worse. With bloody diarrhea and vomiting multiple times a day, she couldn't keep food down. I agonizingly braced for her inevitable death, but it didn't come. After six months, she had put on 20 pounds, but still cowered when people approached her. I could see the pain in her eyes and could not approach her with food.I tried taking her to obedience classes, where she literally stood stock still for every hour of an eight-week class, at the end of which, she couldn't even sit. Still, I continued to train her, a daunting task, as the only way I could reward her was by stroking her ear. Treats would send her out of the ring. Eventually, she completed a few dog classes--but we never returned to obedience. I couldn't teach her to sit reliably or to lie down on cue, even with Janey Shaddrick's outstanding guidance and remarkable patience. I didn't really care, either. She was, after all, alive. After ten months, my partner Bob and I decided to adopt her as a Christmas present to one another, and Sarah has lived with me ever since. I consider Sarah one of the greatest blessings I have ever had. In a home with dogs coming and going--170 fosters in ten years--Sarah speaks dog more eloquently than any dog I have ever met. She's the dog I curl up with when I'm having a bad day. She grounds me and makes me kinder. She touches virtually every one who meets her. In fact, early on a woman I rather randomly encountered described Sarah as "a beacon of light" that would draw people to her. It's true, too. She also told me Sarah and I could change the world. So I shouldn't have been surprised last summer when I took my mother (who has Alzheimer's) on a walk at a dog park and Sarah focused exclusively on my mom's well-being. That day, I brought my mom on a trail we had no business walking on and only realized my error when we could neither return nor continue safely. Noting the uneven, treacherous path well before I did, Sarah paced between us, nudging me persistently as if scolding me for failing to protect my mother, and circling my mother, perhaps to prevent her from falling. Eventually, we did make it out of the park safely, but watching Sarah as I tried to assist my mom, I began to consider the fact that this untrainable dog might just have the makings of a therapy dog. 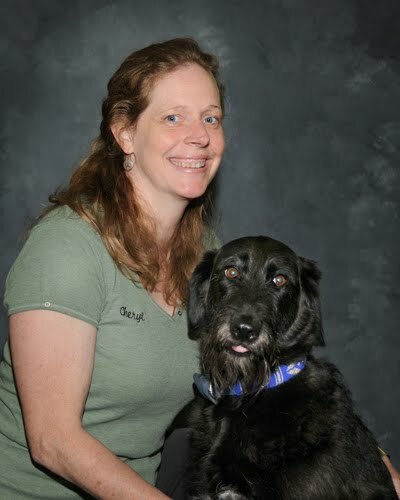 So I talked to Bobbi Stark, a Delta certified trainer at AllBreed Obedience who knew Sarah, and surprisingly, she agreed. We decided to teach Sarah basic obedience commands, and then Bobbi would complete a therapy class with her. When we began, an amazing thing happened: Sarah began to take treats from us. After three years, she finally overcame her fear of food. She also visited a nursing home, where she instinctively learned how to great people and maneuver around wheelchairs. She visited a woman who hadn't spoken in ages, and this woman conversed with us coherently as her caregiver watched on in slack-jawed amazement. Sarah was a natural. And then Bobbi passed the therapy class with Sarah on her first try, followed by Bob, who passed on his first try, too! So, when my mom moved into an Ecumen care facility last week, I began to wonder if I could test Sarah. Last night, on a bit of a whim, I did just that. So now Sarah, my amazing, lovely, rescue dog has been certified to work as a therapy dog with three handlers. Do you know how remarkable that is? She's already visited a nursing home regularly, and I'm working on setting up visits to a memory care unit. We're also talking about working with her in hospice care. Or maybe a veterans' hospital. Or cancer center. Who knows where Sarah will take us? I constantly feel humbled by this dog and so completely grateful to know her. Thanks to every one of you who helped her find her way.